At The Kaplan Center for Integrative Medicine your initial examination will be extremely thorough and unique to you and your particular set of symptoms. Based on the findings of your initial exam, your Kaplan physician may recommend targeted laboratory testing to better isolate the causes of your medical problems. Our physicians utilize a wide range of specialized tests; what is recommended for a particular patient depends not only upon his or her symptoms, but also upon a range of other factors including the patient’s age, gender, and medical and family histories. If testing is recommended, we take the time to thoroughly explain to you the medical necessity and goal of each test. At the Kaplan Medical Center, we want you to understand and participate in your own diagnostic and treatment process to the greatest extent possible. We believe that this level of communication is critical to your recovery and to maintaining your optimal health. The Kaplan Medical Center has entered into exclusive contractual agreements with specialized testing laboratories, such as Genova Diagnostics and Intracellular Diagnostics. These arrangements allow us to conduct highly specialized diagnostic testing that is unavailable in most medical offices — and unavailable even at many hospitals. Specialized diagnostic testing can help identify nutritional deficiencies, metabolic imbalances or the presence of toxins in your body that otherwise might never be identified — or treated. Our physicians closely monitor the performance of the outside labs with which we work to ensure that our patients receive the most accurate and actionable medical testing available today. To ensure that we always provide you with the highest level of medical care, we consult with and refer to a local and national network of top healthcare professionals. This means that your options for treatment don’t end with the wide medical testing and treatments we offer at the Kaplan Center. For example, if, after your Kaplan physician assesses your medical history, he or she determines that you may be suffering from a sleep disorder such as sleep apnea or restless leg syndrome, you may be referred to a sleep study center, where a full overnight evaluation would be conducted. With the results of this testing in hand, your Kaplan physician can then work with you to address this and your other health issues more knowledgeably and effectively. 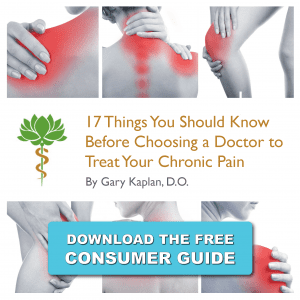 Similarly, if your pain symptoms warrant it, your Kaplan physician may send you for an MRI to help accurately diagnose your chronic hip or back pain and in this way, formulate your best treatment strategies. We put a high priority on communicating with these outside medical professionals because the careful coordination and the sharing of insights and treatment recommendations is absolutely essential to ensuring that you receive the highest possible level of medical care.